Contrary to what you have been told on mainstream media, in 2011 an uprising was manufactured in the Syrian city of Dara’a, and some Syrians desperate for economic change joined the calls for what they initially thought was political “freedom”. Mainstream media outlets have largely described the uprisings as being part of a “protest movement” made up of demonstrators who demand the ouster of Syrian President Bashar al-Assad. But in reality, the main organizers and leaders of this so-called protest movement have been revealed to be U.S.-backed insurgents and foreign militants who have been armed, trained and funded by U.S. and NATO proxies for the purpose of destabilizing Syria through sectarianism. This article will outline the events that took place from January till April in 2011. Detailing what took place before and after the staged uprising in March 2011. 17th of January, 2011: Prior to the anti-government insurgency, and in response to popular pressure, the government “increased the heating oil allowance for public workers by 72 percent to the equivalent of $33 a month”. Late January 2011: A page was created on Facebook called The Syrian Revolution 2011. It announced that a “Day of Rage” would be held on February 4 and 5. February 4th and 5th: These protests called for on Facebook were quite unimpressive, even with media coverage from outlets such as The Times who eagerly fanned the flames of “revolution” and an uprising, in hopes of creating in Syria what mainstream media helped spread in other nations. 9th of February, 2011: The government lifts its ban on Facebook, YouTube, and Twitter, which had been in place since 2007. 13th of February, 2011: The government, through its newly established National Social Aid Fund, begins offering transfer payments to help Syria’s 420,000 poorest families. 15th of February, 2011: The government “reduc[es] duties on a range of basic foodstuffs including rice, tea, powdered milk, coffee, and bananas. It also lowered taxes on vegetable oil, margarine, un-roasted coffee, and sugar”. A picture shows courthouse that was torched a day earlier by angry protesters in the southern town of Daraa, 100 kms (60 miles) south of Damascus, on March 21, 2011 following a demonstration demanding “freedom” and an end to 48 years of emergency laws in Syria under President Bashar al-Assad and his father Hafez. Protesters then forced their way through security barriers and headed toward the Baath Party headquarters and other government symbols. In addition to the party headquarters, protesters burned the town’s main courthouse and a branch of the SyriaTel phone company, which is owned by Rami Makhlouf, a cousin of the president. 20th March 2011: 7 Syrian policemen were killed. 23rd of March, 2011: After sending a delegation to Daraa to investigate events, President Assad sacks the unpopular Governor of Daraa, Faysal Kalthum, and orders the release of the fifteen teenagers who were detained for graffitiing anti-government slogans.According to at least two dissident websites, protesters have given the Syrian government until the morning of March 25 to meet a list of demands that were relayed to the President by his delegation (that include lifting the 48-year-old emergency law and releasing all political prisoners). If the demands are not met, they threaten, March 25 will become the “Friday of the Martyrs” not just in Dara’a and its province, Hauran, which shares a border with Jordan, but throughout the country. 23rd March 2011: Weapons seized that were stored in Al-Omari Mosque in Dara’a. The following is an interview with “Anwar Al-Eshki”, a Saudi Ex-Military (Major General) and now president of “Center for Strategic studies” in Jeddah, Saudi Arabia. He reveals information about the first days of the Syrian crisis, and he even confirms his connections with the “protesters”. Millions of Syrian President Bashar al-Assad supporters poured into the country’s streets in a show of support for their leader calling their protests “loyalty to the homeland”. Sources told Al-Manar TV that there are about two million protesters in Damascus, another two in Aleppo, a million in Hamah, a million in Homos and hundred of thousands in other cities. All roads leading to Sabeh Bahrat (“Seven Seas”) square in Damascus were cut off by police, as men, women, and children raised Syrian flags and pictures of [President Bashar al] Assad and his father, late president Hafez al-Assad. April 10, 2011: 9 Syrian soldiers ambushed on bus and shot to death Syrian soldiers and policemen will be assassinated throughout April (“opposition” will claim that they were executed for desertion from the Syrian army but their funeral videos beg to differ). April 10, 2011: murder of Banyas farmer Nidal Janoud was one of the first horrific murders of Syrian civilians by so-called “unarmed protesters.” Face gashed open, mutilated and bleeding, Janoud was paraded by an armed mob, who then hacked him to death. 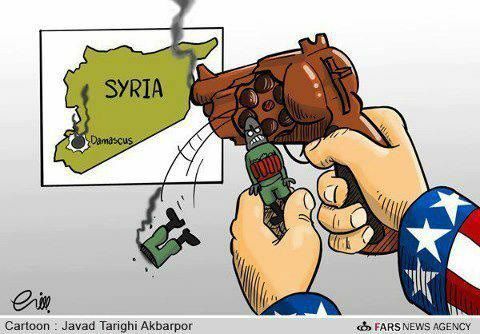 The narrative most commonly put forth in mainstream media portrays the Syrian conflict as a popular uprising. However, as we have seen above a closer examination of the events that occurred in Dara’a in March 2011 – commonly described as the beginning of the conflict – revealed substantial and compelling evidence that not only contradicts the mainstream media’s portrayal but also strongly suggests the involvement, both financially and militarily, of outside influences and actuators. Just found out about your blog thru a mention on Richard Edmondson’s blog. Took a quick look through a couple of posts, including this one. Some great information. I knew this Syria thing was not what the mainstream press and US govt claimed. However, getting information is sometimes tough. Thank you for reporting on all of this, and educating the rest of us. You’re very welcome! Glad you found my site. In this article: https://sarahabed.com/2017/05/12/the-decade-long-u-s-campaign-to-foment-syrias-revolution-and-unseat-assad/ I go over a decade of information. What I did with the one that you read is basically only focus on a 4 month period out of the decade long timeline. I am finding that sometimes my articles are too comprehensive and might be overwhelming for some, so I am trying to write shorter articles but brevity is not really one of my strengths lol. Thank you again for stopping by. I hope you enjoy reading more of my articles and please share the information with others so that we can all help to raise awareness about the truth. Take care! And from the complementary, post-WWII perspective of decades of Muslim Brotherhood attempts to overthrow the Syrian government see Steven Gowans book: Washington’s Long War on Syria. Eva Bartlett tweeted a book talk Gowans gave summarizing the pre-2011 history of repeated violent destabilization. Maybe Sarah has ready access to it. It was really enlightening. Nothing happens in a vacuum, and everything is part of a continuum.